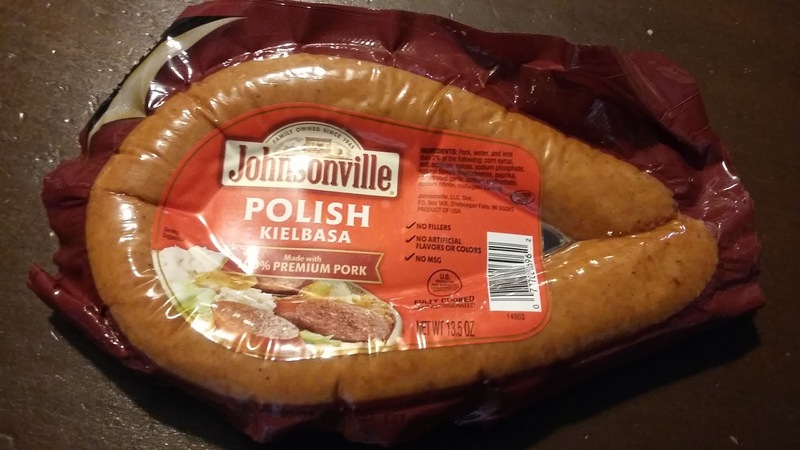 To tell you the truth, I didn't even know Johnsonville made Polish kielbasa. I had never seen this advertised or in any of our stores. In fact, the only reason I learned about this product was because my mom came across it when she was out grocery shopping and, since my wife and I both forgot to make plans for dinner last night, offered us one. Kielbasa is relatively popular in our household. However, we normally buy locally-made kielbasa from one of our grocery stores and I wasn't really sure how this one would compare to those. Unfortunately, while I didn't hate it, I wasn't as impressed with it as I was hoping to be. My biggest complaint about this product is it wound up tasting a bit bland, at least when compared to some other kielbasa we've purchased. This actually surprised me a bit because, when I was cooking this, it smelled a bit spicy and I was afraid it would be the exact opposite. I guess I wasn't the only one who felt this way about this kielbasa either since nobody asked for seconds, something that is VERY rare in our house. One thing I did find I liked about this product was the outer skin wasn't as tough as some other kielbasa we've purchased. I've had some that required a steak knife. This one could be cut relatively easily with a fork. However, that wasn't enough to really win me over. Final Opinion: Like I said, I didn't hate this and, if I were to find it on sale, I would consider purchasing it as an easy-to-make dinner option. However, unless the sale price was a considerable savings over the kielbasa we normally buy, this would be, at most, our second choice.